Dedication - Doll Face Persian Kittens Cattery of ExcellencePre-Loved Persian Kittens For Sale – (660) 292-2222 – (660)- 292-1126 – Shipping Available!! All of our kittens are dearly loved and peacefully prayed over from the moment they enter the world until the day they leave our arms. We kindly ask that you apply for our kittens only if you wish to have a furry friend in your life for the next 10+ years. We specialize in highly unique, ultra rare and one-of-a-kind Persian coat colors. If you are one of those people that crave originality in life, you have arrived at the right website. We work primarily with Teacup and Toy Persians (Kitties that are under 10 pounds at maturity). We offer an array of designer patterns synchronized with elaborate custom colors. The majority of our kittens are like a one of a kind Picasso painting. We hope you enjoy your visit to our furry purry art gallery. Many times people ask us how on earth we have managed to stay in business for so many years, especially in a field that most cat breeders only dabble in for a year or two. We are pretty much homebodies, while we have always enjoyed our “one-day vacations” we know that are furry kids cannot be left unattended for long periods of time, so we work hard to balance our lives in a way that benefits everyone. Our other key ingredient is we LOVE what we do, despite the occasional heartaches of working with living beings and travel restrictions. Looking back and reflecting on the years of grateful customers and exciting places our kitties have taken our names we can’t imagine our lives without our furry children. Our wonderful color pallet is possible because of our family operated business, we all fulfill certain roles so that this cattery remains the best in the business. 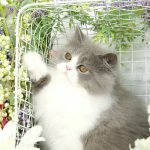 Because we have been in the cattery business for so long we have seen A LOT of Persian cat breeders come and go like the seasons. While many people claim to have been in business for “decades” to comfort the potential customer we align our ethics with being a Better Business Bureau member maintaining an impressive A+ rating. Rest assured you are not only inexperienced hands but also knowledgeable ones. 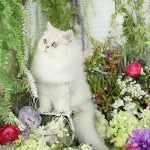 Doll Face Persian Kittens – Making dreams come true, one family at a time for 30 years! Please be advised, we do not accept blocked, private or restricted phone calls. This angelic little facial structure advances our kittens into a heart-tugging class of their own. We hope you enjoy our joyful endeavor to create a face that truly defines what we believe the purrfect Persian and Himalayan face should be.